Ever wanted to play some of Japan’s most popular mobile games on your computer? Well, me too. So let me walk you through how to do it. Before we get started, it’s important to keep in mind that your computer is not an Android phone or tablet. Because of this, not all games you can download will work. While Fate/Grand Order, Tsum Tsum, Hortensia Saga and Monster Strike play fine for me, the Irregular at Magic High School game and Puzzle Dragon don’t even start up (at least on my particular PC). However, those that do work connect to the same game server as everyone else—and even to the game’s various micro-transaction filled stores. So you’re getting the same basic experience as everyone else—only on a PC. So with that out of the way, let’s get down to it. Step 1: Download BlueStacks (a free Android-based emulator) from the official webpage. Note: The first time I installed BlueStacks, it never moved past the initializing screen above—even after rebooting my computer. To fix this, I had to uninstall it, reboot, and install it again with no other programs running. If all is installed correctly, BlueStacks should now look something like this. Step 1: Go to QooApp’s website. Step 2: Click on the QooApp icon in the top left. Step 3: Click “Download” to download QooApp. 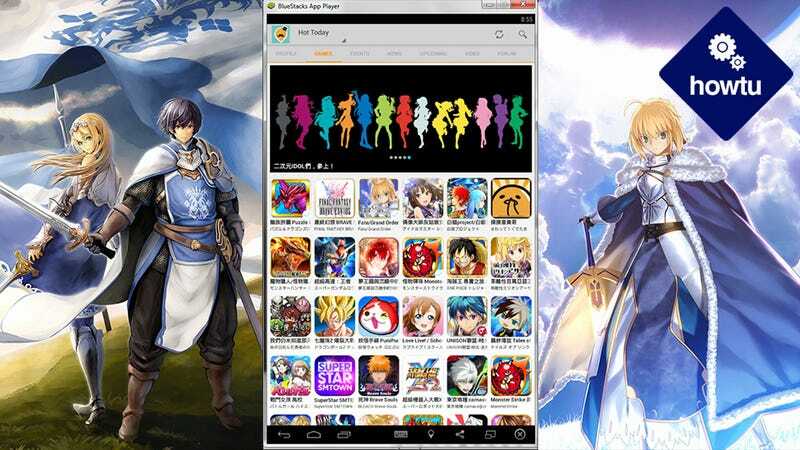 Step 4: Go to your download folder and double click on the file “com.qooapp.qoohelper-59-8834827-1445331721.apk”to install it into Bluestacks. Note: After QooApp installs, BlueStacks should automatically ask you to configure BlueStacks. Step 2: Click “New” to make a new Google account or click “Existing” to use one you already have. Note: For this guide, I will assume you already have your own Google account. Step 3: Enter your Google account name and password and click the arrow at the bottom right. Step 5: Select the Google services you want and then click the arrow at the bottom right. Step 1: Click on the QooApp icon. Note: If it’s not in the top row, click “All Apps” and click the QooApp icon on that page. Step 2: Click the game you want to download from the QooApp list. Step 3: Click “Download” to download the game. Note: For future reference, this is also where you go to update the game as the “Download” button will become an “Update” button. Step 6: Click “Done” to return to BlueStack’s home screen or “Open” to play your newly downloaded game. Step 2: Click on “Profile” at the top left. Step 4: Click the game you want to uninstall. Step 5: Click the three vertical dots in the top right. Step 7: Click “OK.”The game is now uninstalled. There you have it. If all has gone well, you are now playing mobile games on your PC. Occasionally, BlueStacks will ask you to upgrade to a premium version or download some games. So pick your poison. Other than that, however, you’re good to go. Have fun!